As I write this, I'm home with my two kiddos (again) who are on their 6th snowday. The last day of school, yet again bumped to June 22nd. It's still snowing, we just hit 18 inches of snow. The worst part? Word on the street is that we're due for another Nor'Easter next week. So on that note, I hope you're cozy, warm and safe if you're in this madness. If you're someplace sunny, then I'm just jealous! Please send some warmth our way! Here's to sunny and warm days ahead! Oh No! Jessica!!!! How awful. We get a lot of snow here but usually only have one or two days of 'snow days' for school...and then they try to make the time up before the end of the school year. Thanks Diana! I hope you’ve had a good week! Well, it is warmer than that and definitely sunny here in central FL. We did have to turn the heat back on to take the chill off in the early mornings. I'm sorry for you and all who are snowed in and many without power. I have lived in the cold, snowy north and would not go back for anything. Stay safe up there! I'm so over it! Bring on the warm, sunny days please!! 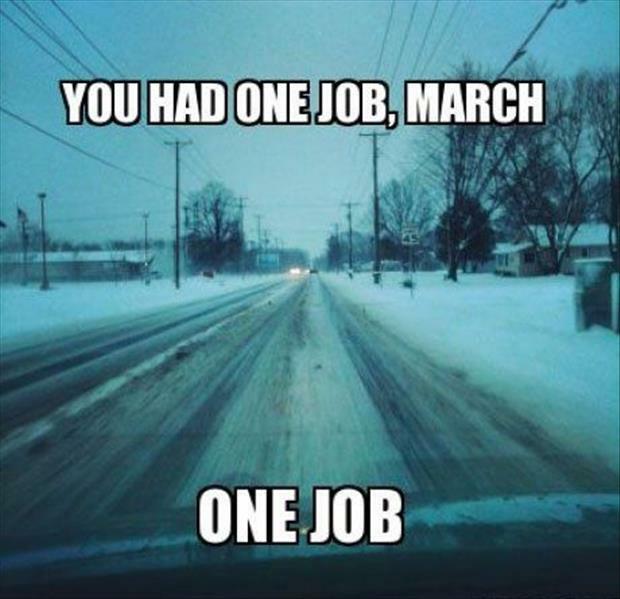 March is my least favorite month .. it never can make up its mind. Happy you got to spend extra time with your sweet girls. Stay warm, cozy and safe. I thought we got hit bad in our last snowfall, until I heard what was headed your way. Ugh!! I should check in with my sister and see how they are doing, I know she was worried. Hoping the next Nor'Easter spares you so school doesn't get pushed further into the summer! Sorry about all the snow! I guess I have nothing to feel sorry about. I keep complaining because we have non-stop rain. So ready for spring! Praying you guys don't get any more snow storms this year. Thanks Kelleyn -We actually got another 24 inches this past Wednesday so I guess I shouldn’t have complained at all! Spring can’t come soon enough! I thought we got hit terrible in our last snowfall, until the point when I heard what was traveled your direction. Ugh!! I should check in with my sister and perceive how they are getting along, I know she was concerned. Trusting the following Nor'Easter saves you so school doesn't get pushed assist into the late spring!